Most people can probably remember the first time they tried tofu. Chances are, it was in a restaurant dish, or offered to you by a non-meat-eating friend. Or maybe you’re a brave soul who saw the mushy block of white bean curd at the grocery store and just went for it. Regardless, tofu takes some getting used to. Turning coagulated soy milk into a flavorful meat replacement involves a learning curve—one that’s well worth it for tofu-lovers. But if you’re wondering how someone could prefer this to meat, I hope you’ll read on. Tofu is the chameleon of the plant-based food world. Its porous, spongey texture lends itself perfectly to absorbing other flavors. Its consistency—ranging from silken to extra-firm—can be chosen to complement a variety of recipes, from creamy desserts to fried, crunchy nuggets. It serves as an important source of cholesterol-free, complete protein for many following a plant-based diet. A single three-ounce serving packs a surprising amount of nutrients for only 70 calories, making it extremely nutrient dense. Soy products also contain isoflavones—plant-derived phytoestrogens—which have been linked to heart and bone health, and improved outcomes for type 2 diabetics. Still, for many health-conscious eaters, tofu is a hard sell. Soy remains controversial due to being one of the most common genetically modified foods, thanks to Monsanto. Always make sure to buy non-GMO, organic tofu to avoid this issue. Like many plant foods, soy contains phytates that can reduce the absorption of other nutrients. This is one reason the paleo community avoids grains and legumes. So look for sprouted tofu, which has drastically reduced phytates and more protein. Fermented soy, such as tempeh, also has far less nutrient-blocking compounds and contains beneficial probiotics. It’s important to be informed and make conscious food choices, regardless of where you fall on the plant to meat-eating spectrum. Now, I don’t care how much you love meat, this recipe will not disappoint. The crumbled tofu, once browned, is like ground meat in texture but has mild enough flavor to allow the tangy tomatoes, fresh basil, garlic, and peppers to take center stage. Balsamic-roasted portobellos are the perfect, juicy bowls for holding the chunky tofu-tomato sauce. You can also add sprinkled goat cheese before baking to melt into the sauce, creating a mini-style pizza. Easy enough for a quick week-night meal, fancy enough to impress your friends, and so healthy you can feel great after eating it. -Open tofu package and drain off excess water. Cut tofu into blocks and press between paper towels to remove as much water as possible. -Preheat oven to 400 degrees and line baking sheet with parchment paper or use cooking spray. -Lightly coat mushrooms in olive oil, place mushrooms on baking sheet cap side down, and sprinkle balsamic vinegar evenly across each. -Roast for 5 minutes, remove from oven. -Meanwhile heat 1 Tb olive oil in large saucepan over med-high heat. -Crumble tofu into pan and stir to coat in olive oil, let cook about 10 minutes or until starting to brown. Stir in garlic, bell pepper, and onion and cook another 5-10 minutes. -Pour in can of tomatoes and stir in basil, reduce heat to medium-low and let simmer until sauce is heated through. 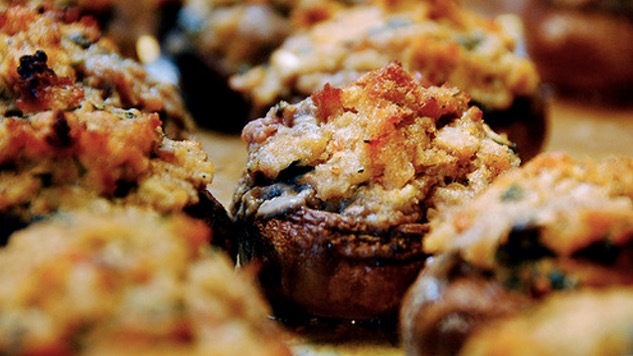 -Spoon mixture into mushroom caps, return to oven and bake another 10-15 minutes. -Optional: add goat cheese before baking to melt into tofu for added creaminess. Ashley Sigmund is Paste’s Recipe for Fitness columnist. She is a Denver-based dietitian promoting wellness through whole foods and plant-based nutrition.